If your apple season is winding down with A LOT of apples, or if you stumble into a great sale at the grocery store, then you likely have enough apples to make apple juice and/or jelly! First, prepare apples for extracting their juice. If you plan to make jelly and use purchased pectin, then you can use all ripe apples. If you are going to make jelly and rely on only the natural pectin in apples, then use ¼ slightly under-ripe apples and ¾ just ripe apples. Make juice in small batches – about 3 pounds of apples with 3 cups water will produce 4 cups apple juice. Sort the apples, discarding damaged portions. Wash the apples and cut them into pieces, but DO NOT remove skins or cores – the pectin is most concentrated in the skins and cores. Now you’re ready to extract the juice. Place fruit into a flat-bottomed saucepan and add one cup water per pound of apples. Bring to a boil on high heat and stir to prevent scorching. Reduce heat and cook until soft, about 20 to 25 minutes. Be careful not to overcook; too much boiling will destroy the pectin, flavor, and color. 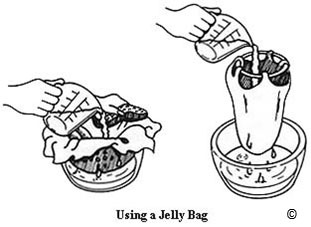 To clarify the juice, pour the entire contents of the saucepan into a damp jelly bag and suspend the bag so that the juice drains into a large bowl. For the clearest juice (and therefore the clearest jelly), do not press or squeeze the jelly bag. Once the juice is clarified, you may freeze it. Be sure to leave 1½-inch headspace and use a moisture-proof, durable freezer container. If you think you might use the juice for jelly, then do not presweeten it before freezing. Follow these directions if you want to use the juice in Apple Jelly without added pectin. Refer to pectin product packaging and follow those directions if you prefer to make jelly with added pectin. © Andress, E.L., Harrison, J.A., eds. (2006). So Easy to Preserve, 5th ed. Athens, GA: University of Georgia Cooperative Extension. This entry was posted in Canning, Freezing, Jams and Jellies, Recipes, Seasonal Food Tips and tagged apple jelly without added pectin, apple juice, Apples, boiling water canning, canning apple jelly, canning apple juice, making apple jelly, making apple juice on November 5, 2013 by nchfp.